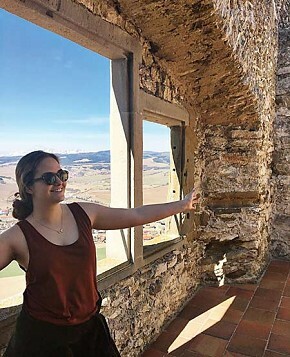 Lauren in the Spišsky Hrad (Spiš Castle) with the High Tatras (Slovak mountains) in the background. 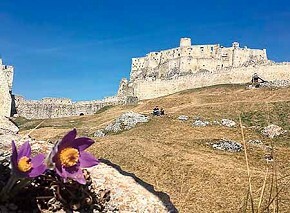 The Spišsky Hrad (Spiš Castle) in the background with some rare flowers of the Spiš region. Time is flying by and it feels like pretty soon I’ll be the one flying – back to Florida! Just the thought of leaving makes me sad, but also reminds me of all that’s to come in the last three months of my exchange! Now that the sun is out, ice cream is being sold on the street, parks are full of picnickers, and castles are open for tourists again! A day trip to one of the largest castle sites in Central Europe, Spišský hrad (Spiš Castle), ended up including much more than just that. After seeing the castle we visited a family living in the region where we got to see bee colonies, collect mineral water, and dig up some horseradish roots! The “M” in March should stand for “music” – or maybe the “c” for “concerts”! Early in the month a Slovak band from Bratislava, King Shaolin, was playing a concert in Košice so we decided to check it out. Though we didn’t know much about the band or their music before going, we did know that they sang in English, and that was enough to interest us! Turns out, their music was great and we all had a fun night! Later on, we heard about another concert from some of my classmates and decided to go to that one as well! Because of the culture surrounding the artist, GLEB, and the particular style of music, rap/grime, we were told that it would be a great experience for us exchange students. They were right! The concert was sold out and there we were, three foreigners who could barely even understand the lyrics, among hundreds of Slovaks screaming every word! We didn’t need to understand to have a good time! Besides new music, this month has also included a few new athletic activities. I’ve tried bouldering (or rock-wall climbing as I’ve always called it), attended a BodyPump workout class, played in a school basketball tournament, and even dabbled a bit in ping pong at a tournament with the other exchange students! It seems as thought everyone here knows how to play ping pong to some degree, with tables in every school and gym, while back in Florida I haven’t even seen a ping pong table (let alone tried playing) in about ten years! Regardless, it was still a fun experience with a bit a friendly, or should I say international, competition! Between Rotary events and family invites, now that our host families all know each other plans have tended to include all of us exchange students together. We welcomed Becky into her new host family, went to a Rotary book auction, visited the zoo, and even attended a music showcase for Finn’s/Joaquín’s host brother who’s learning to play the guitar! He had the biggest fan club there! We also had an exchange student barbecue where I discovered a new ability of mine…grilling! Who knew I would have to leave America to learn how to grill a steak? When no one volunteered to be the designated grill master, I was happy to step up and try it out! We had a variety of meats—chicken, veal, beef, and little sausages wrapped in bacon—and of course a bonfire with some tunes! Everyone said that they enjoyed their meat, so I guess I passed the test of being an American! Before all of the snow melts, my first host family wanted to fit in one more ski trip and decided to bring me along. I thought that my skiing days were over, but I guess not yet! Everything was great! The sun was shining, the birds were chirping, and the snow was a mix between ice and slush—fantastic! *said sarcastically* It wasn’t long before I fell and continued to slide down the slope for about 25 meters until some very nice Czech skiers saved the day and helped me stop. What began as a simple slip turned into me becoming a human snowball! What a nice way to finish my Slovak skiing career, right? Despite my public scene of embarrassment, the trip was a fun time of reuniting with my first host family and experiencing the last bit of winter with them—I don’t think I’ll be seeing anymore snow for a while! Spring has officially sprung here in Slovakia and I never thought I’d be so happy to have sun in my eyes and warmth on my back! I think I might even feel a slight sunburn coming on!